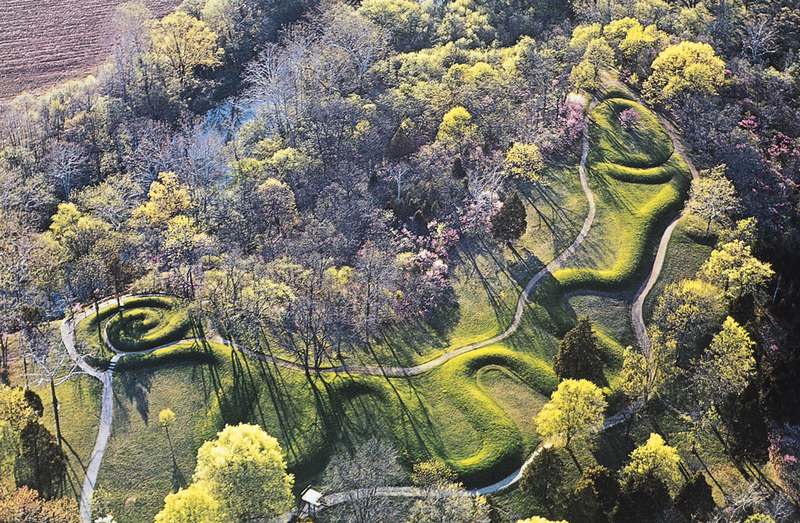 Serpent Mound is an earthwork of a snake seizing a huge egg. It dates from a time period without any written records. For that reason it represents one or more stories. It is shown, that it tells the well-known story of the Egyptian discovery of America and the Biblical Flood. In c.1100 BC the monument was updated by placing a heap of stones in the center of the egg. With this new feature the monument also tells the story of the metal trade and the Dardanus Flood. 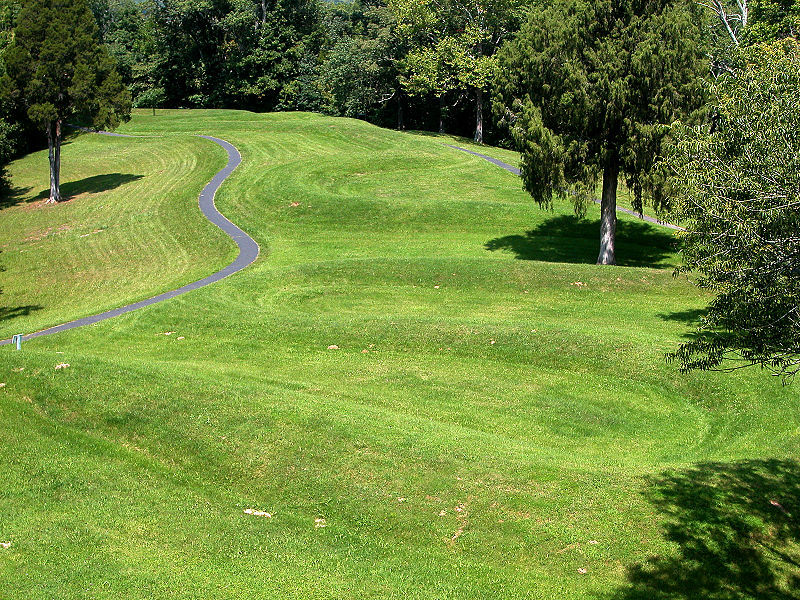 Serpent Mound is one of the most important monuments of North America. It is part of our worldwide cultural heritage. Basically, the monument consists of three parts: the coiled tail, the twisted body of the Serpent, and the endpart, containing the head of the snake, the large egg, and maybe a small mound beyond it. A correct description should start with the coiled tail (Fig.1). The beginning of the tail is small. It has a width of 2 feet (0.6m) and a height of 1 foot (0.3m). It points 20oNNW to the center of the egg at a distance of c.460 feet (140m). The tail curls to the left, against the daily movement of the Sun. It gradually increases in size, until it reaches a width of c.20 feet (6.1m) and a height of c.4.5 feet (1.4m) at the start of the body of the snake, which is at a direction of 30oENE from the start of its tail. The triple coiled tail has an outer diameter of c.100 feet (30m). The body of the Serpent curls slowly to the left, again, against the movement of the Sun. It consists of four bulges pointing in eastern directions, each of these having the shape of a cosinus. The eight zigzags finish at a straight piece of line, which belongs to the head of the snake. Including the twists of the body, the overall width of this part is about 60 feet (18.3m). The head of the Serpent starts with a straight piece, pointing 26oWNW. It points to the triangular part, which contains an upper jaw having an inside length of 61 feet (18.6m), and a lower jaw with a shorter, inside length of 56 feet (17.1m). On the average each of the banks are 58.5 feet (17.8m) long and 17 feet (5.2m) wide. At the throat of the snake the thick wall is 30 feet (9.2m) wide and 5 feet (1.5m) high. At an inside distance of 47 feet (14.3m) from the throat is a crescent shaped wall of the same width (17 feet), which is the edge of the mouth. The extremities of this crescent are 75 feet (22.9m) apart. The egg starts at an inside distance of 9 feet (2.7m) from the mouth. The egg is 120 feet (36.6m) long, and 60 feet (18.3m) wide, both measured from the outside. The bank is here c.4 feet (1.2m) high and 18 feet (5.5m) across. Near the center of the enclosed area is a small mound of stones, which was formerly much larger. Behind the egg in the west appears to be a low triangular mound at an inside distance of maybe c.9 feet (2.7m). Its east side has a length of c.32 feet (9.8m), about equal to the length of its axis to the west. The dimensions of parts of the earthwork may be of importance for the explanation of the monument. However, we are facing problems in the choice of these parts, and how to measure these dimensions. Sometimes, we are not completely sure if a part has been well preserved over the centuries involved. The distance from the start of the tail across the deep gully in the hillside to the west end of the egg, pointing 26oNNW, is 496 feet (151m). To the center of the egg appears to be 496-36= 460 feet (140m). From the outer edge of the coiled tail to the west end of the egg is 496+60= 556 feet (170m). The length of the serpent along the dorsal ridge to the throat, following all the curves, and from the throat directly to the west end of the egg, is 1348 feet (411m). However, (via the throat) to the tip of the upper jaw is 1254 feet (382m). (Via the throat) to the crescent is 1254- 61+47= 1240 feet (378m). To the west end of the egg is 1240+3+120= 1363 feet (416m). From the tip of the upper jaw to the west end of the egg is 1254+120= 1374 feet (419m). Including the upper half of the cresent and part of the upper half of the egg is 1374+75= 1449 feet (442m). It appears, that only the last distance, following all the curves, is really important (as shown below). Serpent Mound is located at 39oN. The southern Aleutian Islands near the Bering Sea are located at the complementary latitude of 90o-39o= 51oN. It means the monument dates from after the Egyptian discovery of America, c.2570 BC. It is located at the latitude of the West Azores, at 39oN. It means it dates from after the discovery of the Return Route across the Atlantic from Newfoundland to the Azores, c.2505 BC. From 2500 to 1200 BC America was part of the Egyptian World Empire (Atlantis). It was a colony of Egypt. So, it appears the makers of Serpent Mound believed in the Egyptian SunGod Ra. Basically, the monument consists of three parts, encoding the Nile Delta, at 30oN. It is the economic center of Egypt, the greatest civilization on Earth. The triple coiled tail of the Serpent confirms it. Its round shape symbolizes the Old World. The tail turns to the left, against the daily movement of the Sun. So, people sailed from west to east. The end of the tail points 30oENE. So, people sailed from the Nile Delta, along the east coast of China, at 30oN, in northeastern direction. Serpent Mound is located at 39oN. So, America was discovered via the southern Aleutian Islands, near the Bering Sea, at the complementary latitude of 90o-39o= 51oN. The body of the Serpent consists of four bulges, pointing to the east, which correspond to the Fourth Dynasty. The head of the Serpent is the fifth feature, encoding the 5th king. So, the 5th king Menkaure (Mycerinos, c.2580-2562 BC) of the Fourth Dynasty discovered the New World (Fig.1). The large egg symbolizes this New World. The head of the snake points in northwestern direction, where America was discovered. Brush Creek symbolizes the Pacific Ocean. The lower jaw of the head represents the Aleutian Islands. The upper jaw symbolizes a second crossing. So, on the return route king Menkaure discovered the crossing of the Bering Strait. 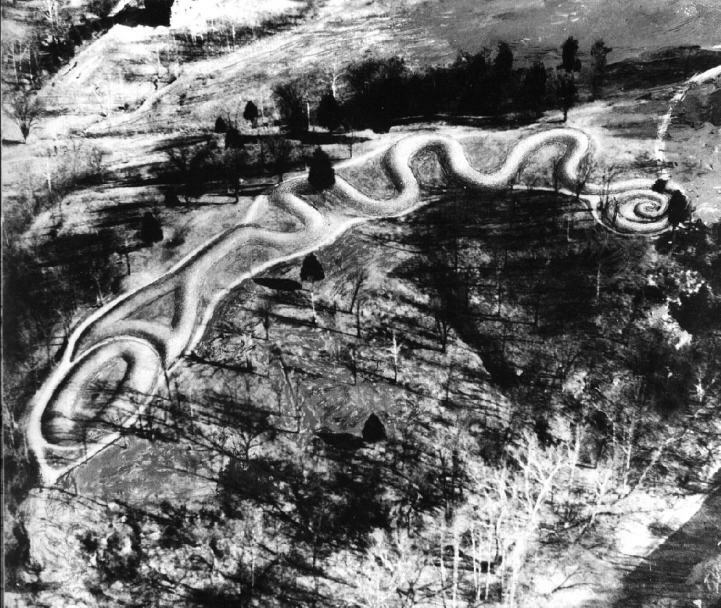 Serpent Mound is located on the east bank of Brush Creek, which now symbolizes the Atlantic Ocean. So, it also describes the discoveries in the east. The triple coiled tail encodes the sailing direction of the Southern Crossing, from the Cape Verde Islands to South America, with the wind and the current, 30oSSW. The four bulges of the body and the head of the snake form together five units, corresponding to its destination, Cape São Rock, Brazil, at 5oS, but also the Fifth Dynasty. The round tail and the egg form together two units, encoding the sailing distance of 2 Moiras, or 20o, but also the 2nd king. So, the second king of the Fifth Dynasty, Sahura (c.2510-2498 BC), discovered the Southern Crossing. The round tail and the egg form together two units, encoding the (initial) sailing direction from Cape Race, Newfoundland, 20oESE, and the sailing distance of 2 Moiras, to the two islands of the West Azores. It is the return route, with the wind and the current, to the Old World. Serpent Mound is located at 39oN, which is the latitude of the West Azores. The round tail and the egg also encode the second king. The lower and upper jaw of the head of the snake confirms it. So, the 2nd king Sahura also discovered this second crossing. The axis from the start of the tail through the center of the egg points 20oNNW, confirming it. The round tail, the egg, and the head of the snake form together three units, encoding the Northern Crossing of the Ocean at the complementary latitude of the Nile Delta, at 90-30= 60oN. The head of the snake points NW, in the direction of the initial sailing direction. One crossed from the Shetland Islands via the south point of Greenland to Cape Chidley, Canada. This third crossing via these three landpoints was discovered by the 3rd king. The head of the snake not only has an upper and lower jaw, but also a mouth. So, the third king of the Fifth Dynasty, Nefererkare (c.2498-2478 BC), discovered the Northern Crossing. The three mentioned units encode Abaco Island, Northern Bahama’s, 3o below the Nile Delta, at 30o-3o=27oN. The round tail and the egg correspond to the latitude of Bermuda, 2o above the Nile Delta, at 30o+2o= 32oN. It is the start of the last discovered crossing of the Ocean. The triple coiled tail, the body and head of the snake, and the egg form together 3+5+1= 9 units, confirming Bermuda, 9o above the holy Tropic of Cancer, at 23o+9o= 32oN. At midsummer day the Sun is at right angles above the Tropic of Cancer. The slow northerly movement of the Sun turns into a southerly movement. So, one believes in the Egyptian SunGod Ra. The holy Tropic of Cancer crosses the River Nile, at 23oN. It is the center of the Southern Egyptian Empire, but also of the Sun religion. The 9 units correspond to the nine islands of the Azores. Serpent Mound is located 9o above the Nile Delta, at 30o+9o= 39oN, confirming it. So, the return route from Abaco Island via Bermuda to the Azores was discovered by the 9th and last king Unas (c.2403-2370 BC) of the Fifth Dynasty. The latitude of the Nile Delta, at 30oN, encodes the long sailing distance from Bermuda to the Azores, with the wind and the current, 3 Moiras, or 30o. Then, suddenly, a huge Comet appeared in the sky. The egg symbolizes the Head of the Comet, and the Serpent its Tail. The wedge-shaped ridge below the monument confirms it. The ridge, and the Brush Creek besides it, show the Comet consisted of a huge amount of stones and water. The round tail of the snake shows the Flood happened because of a cosmic collision of the planet Earth with the Tail of a Comet (or Comet Swarm). Long ago the area was struck by an astroide, confirming the astronomical meaning of Serpent Mound. The three coils of the tail encode the 30 days of the month. The triangular head of the snake refers to another 30 days. So, the Earth stayed in the Tail of the Comet for a time period of two months, or 2x30= 60 days. The falling stones caused huge forest-fires, and because of melting ice there were torrential rains, and huge floodings everywhere. It was completely dark on Earth. This time period was probably the worst. The whole climate was completely disrupted. The length of the egg equals twice its width. So, there was a second time period of 60 days. The torrential rains and floodings continued, and it became bitterly cold. Slowly the terrible rainfall changed into snow and hail storms. The 9 units of Serpent Mound refer to the North Pole, at 90oN. Many people died from starvation. It was a worldwide Disaster. The Serpent Mound devides the surface area of the ridge in two (Fig.1). The eastern area represents the first time period of 2 months, and the western area is the second time period of 2 months. The four bulges of the body of the snake confirm the total duration of the Catastrophe, 2+2= 4 months, or 4x30= 120 days. The total length of the monument, following all the curves, equals 444 meters, or 4 millimoiras, confirming it. Besides the four bulges, the snake has a triple coil, illustrating the millions of people on Earth before the Flood (a number of 4+3= 7 figures). The head is the 8th unit of the snake. The four bulges and the head show the initial world population was 4.8 million men. The egg represents the 9th unit of the monument. It refers to the East Cape of North America, on Newfoundland, 9o above Serpent Mound, at 39o+9o= 48oN. This latitude confirms the initial world population. The length of the egg equals twice its width. It illustrates that about half of the world population died (circa 2.4 million men). The four bulges, the head of the snake and the egg form together 4+1+1= 6 units, encoding 2.6 million casualties (54%). The axis through the head and the egg points 26oWNW, confirming it. The axis from the center of the tail to the west end of the egg points 26oNNW, confirming it. Serpent Mound is located 39o-13o= 26o above the continent of South America, confirming it, again. Basically, the monument consists of three parts: the coiled tail, the twisted body of the Serpent, and the endpart. These three units refer to Cape Hatteras, the East Cape of the U.S., 3o below Serpent Mound, at 39o-3o= 36oN. This Cape refers to the circumference of the planet Earth, 36 Moiras, or 360o, which shows it was a woldwide Catastrophe. The complementary latitude, at 90o-36o= 54oN, confirms the percentage of casualties, 54%. The relative latitude of the East Cape of North America confirms this percentage, again: (48/90)x100= 54%. The length of the egg equals twice its width. It also illustrates that about half of the world population survived. The egg and the head of the snake form together 2 units, confirming the number of survivors, 4.8-2.6= 2.2 million men. Most of them were seriously injured. Both the round tail and the egg, and the round tail and the head, each form two units, confirming it. The SW Cape of Greenland, at 61oN, is located 61o-39o= 22o above Serpent Mound, confirming it, again. Greenland consists of stone and ice. Traditionally, it always symbolized the Head of the Comet, with the North Atlantic Ocean below it, as its Tail. The Serpent Mound devides the surface area of the ridge in two. The eastern area symbolizes the 2.6 million people who perished (54%), and the western area represents the 2.2 million people who survived. The three coils of the tail, the four bulges of the body, and the head of the snake form together 3+4+1= 8 units. These correspond with the total precipitation during the Flood, about 80 micromoiras= 80x0.11= c.8.9 meters of water. Cape Race, Newfoundland, at 47oN, is an important starting point for the return route to the Azores. It is located 47o-39o= 8o above Serpent Mound, confirming it. The four bulges and the head of the snake form together five units, encoding the Fifth Dynasty, which was ended because of the Comet Catastrophe. The egg is the 6th unit, representing the weak Sixth Dynasty, when the Flood occurred. The round tail (with its three coils) encodes the first king Teti (c.2370-2338 BC). It happened in c.2344 BC during his reign (tree-ring dating). The latitude of the SW Cape of Greenland, at 60o+1o= 61oN, confirms that it happened in the Sixth Dynasty during the reign of the 1st king Teti. In the center of the egg is a heap of stones (Fig.1). This feature is completely different from the earthen walls in the rest of the monument. It appears, that it was added to the original monument at a later date. Serpent Mound was updated because of new, important developments in America. Serpent Mound contains a total of 9 units, corresponding to Isle Royale, Lake Superior, 9o above the monument, at 39o+9o= 48oN. It was the center of copper mining in North America. The 9 units also correspond to the density of copper, 9 g/cm3 (nine times heavier than water). The tail of the Serpent in the south has three coils, encoding the Mississippi Delta, at 30oN. It shows, that 3/5, or 60%, of the copper was shipped along the Mississippi River to the south. The egg and the head of the snake encode the mouth of the St. Lawrence River, 20o higher, at 30o+20o= 50oN. It shows, that 2/5, or 40%, of the copper was transported to the east. The Serpent contains a total of 3+4+1= 8 units, which shows that tens of millions of copper ingots were shipped to the Old World (a number of 8 figures). The egg is the 9th unit of the monument, referring to Isle Royale, at 39o+9o= 48oN. The width of the egg is half of its length. So, the overall export was 48/2= 24 million ingots. The Serpent Mound devides the surface area of the ridge in two, confirming it. For a long time past the noble metals were weighed in units of carats, corresponding with 0.20 gram. The carat is the constant mass of a seed of the St. John’s bread or carob tree (Ceratonia siliqua). The Serpent contains a total of 8 units. The four bulges and the head form together 5 units. So, the Standard Ingot will have a mass of 80,000 carats (a number of five figures), or 80x0.20= 16 kg. It means, that the overall export of copper across the Ocean would be (24x16=) c.384,000 tons. It has been estimated by others in the field, that a total amount of 250 to 500 thousand tons of copper had disappeared from the mining area. So, our conclusion is that its destination can now be understood. In the Old World bronze was made by alloying the copper with 10% tin. The heap of stones in the center of the egg is the 10th unit of the monument, confirming it. Tin was a very scarce metal. Although generally unknown, a lot of it was imported from South America. Isle Royale is located 18o above the Mississippi Delta, at 30o+18o= 48oN. It also refers to the tin mines near the present town of Oruro, Bolivia, at 18oS. The tin was transported (as ingots) along the coast to the north, and from the Pacific to the Atlantic. Serpent Mound has a total of 9 units, encoding the isthmus of Panama, at 9oN, as well as the nine islands of the Azores. In the Bronze Age the overall export of tin from the mentioned site was 10% of the copper, or 2.4 million tin ingots (a number of 7 figures). The triple coiled tail and the 4 bulges form together 3+4= 7 units, confirming it. It also corresponds with the density of tin, 7 g/cm3 (seven times heavier than water). The quantity corresponds with c.38,400 tons of tin. Silver was found together with tin. Including the heap of stones the monument has 9+1= 10 units. The egg will be the 11th unit, encoding the density of silver, 10+1= 11 g/cm3 (eleven times heavier than water). According to the normal counting the Serpent contains 8 units, and the important egg is the 9th unit. So, both encode an overall export of 90 million carats (a number of eight figures), or 90x0.20= 18 tons of silver. Most of the silver in the Old World was imported from Bolivia, in South America. Gold is a completely different story. In this early time period it was almost exclusively traded at the mouth of the Amazone River. Including the heap of stones the monument has 9+1= 10 units. The old monument contained 9 units. So, the egg will be the 10+9= 19th unit, encoding the density of gold, 19 g/cm3 (nineteen times heavier than water). The head of the snake and the egg form together two units, encoding the important latitude, at 2oS. The Serpent contains 8 units. The four bulges and the head of the snake form together 5 units. Both encode an overall export of 50 million carats (a number of eight figures), or 50x0.20= 10 tons of gold. However, most of the gold in the Old World was imported from Africa. The four bulges of the body of the Serpent illustrate the transport of four different metals from America to the Old World. Including the heap of stones the monument has 9+1= 10 units. So, the heap of stones might represent the 10+10= 20th unit, encoding the Twentieth Dynasty. It determines the date of the heap of stones (Serpent Mound II, c.1100 BC). The axis from the center of the tail to the heap of stones points 20oNNW, confirming it. The three coils of the tail encode the 30 days of the month (Fig.1). The four bulges of the body of the snake show the Earth stayed in the Tail of the Comet for a time period of 40 days. The total length of the monument, following all the curves, equals 444 meters, or 4 millimoiras, confirming it. The falling stones caused huge forest-fires, and because of melting ice there were torrential rains, and huge floodings everywhere. It was completely dark on Earth. This time period was probably the worst. The triangular head of the snake also encodes the 30 days of the month. The four bulges show there was a second time period of 40 days. The torrential rains and floodings continued, and it became bitterly cold. Slowly the terrible rainfall changed into snow and hail storms. The 9 units of Serpent Mound refer to the North Pole, at 90oN. Many people died from starvation. It was a worldwide Disaster. The Serpent Mound devides the surface area of the ridge in two. The eastern area represents the first time period of 40 days, and the western area is the second time period of 40 days. The Serpent contains a total of 3+4+1= 8 units, confirming the total duration of the Catastrophe, 40+40= 80 days. Cape Race, Newfoundland, at 47oN, is an important starting point for the return route to the Azores. It is located 47o-39o= 8o above Serpent Mound, confirming it. Including the heap of stones the monument has 9+1= 10 units. The Serpent contains 8 units. So, the head of the Serpent might be considered as the 10+8= 18th unit. It encodes the world population before the Flood, 18 million men. The old monument had a total of 9 units. So, the egg might also be considered as the 9+9= 18th unit, confirming it. The round tail, the head of the snake, and the egg form a total of 3 units, referring to Cape Hatteras, the East Cape of the U.S., 3o below Serpent Mound, at 39o-3o= 36oN. The Cape refers to the circumference of the planet Earth, 36 Moiras, or 360o, which shows it was a worldwide Catastrophe. The width of the egg equals half of its length. So, it also refers to the civilization around the south point of the Gulf of Campeche, Mexico, at 36o/2= 18oN. It is the center of the Realm of the Dead. It confirms the initial world population of 18 million men. The four bulges of the body of the snake encode the c.4.0 million casualties. The total length of the monument, following all the curves, equals 444 meters, or 4 millimoiras, confirming it. The latitude of Serpent Mound, at 39oN, confirms the c.3.9 million victims. – The head of the snake and the egg form together 2 units, encoding the additional 2.0 million victims because of system collapse (lack of government). The axis from the center of the tail throught the heap of stones in the egg points 20oNNW, confirming it. Cape Farvel, the south point of Greenland, is located at the complementary latitude of the Nile Delta, at 90o-30o= 60oN. It confirms the 4.0+2.0= c.6.0 million casualties of the Dardanus Flood (32%). Greenland consists of stone and ice. Traditionally, it always symbolized the Head of the Comet, with the North Atlantic Ocean below it, as its Tail. The island of Bermuda, at 32oN, confirms the percentage of casualties, 32%. Including the 3 walls of the head of the snake, the old monument contained a total of 9+3= 12 units, confirming the number of survivors, 18-6= 12 million men. Many of them were seriously wounded. The southern Aleutian Islands are located 51o-39o= 12o above Serpent Mound, confirming it. Abaco Island, northern Bahama’s, is located 12o below the monument, confirming it, too. The south point of the Gulf of Campeche, Mexico, is located 30o-18o= 12o below the Nile Delta, confirming it, once again. The four bulges and the head of the snake form together 5 units, encoding the precipitation during the Dardanus Flood, 50 micromoiras= 50x0.11= c.5.5 meters of water. The complementary latitude of Serpent Mound, at 90o-39o= 51oN, confirms it. The town of Hillsboro and the city-center of Dayton point 50oNW from the site, confirming it, again. Including the heap of stones the monument has 9+1= 10 units. So, the heap of stones might represent the 10+10= 20th unit, encoding the Dardanus Flood in the Twentieth Dynasty. The axis from the start of the tail to the heap of stones points 20oNNW, confirming it. The Serpent Mound devides the surface area of the ridge in two, confirming it, again. The round tail and the egg form 2 similar units. Together with the head of the Serpent it forms 3 units. So, the Dardanus Flood occurred during the reign of the 2nd king Ramses III (1184- 1153 BC). It happened at the end of his reign, in 1159 BC (tree-ring dating). The axis from the center of the round tail to the heap of stones points 20oNNW, and to the start of the body of the Serpent 30oENE, confirming it. 2. Squier, E.G., and Davis, E.H., "Ancient Monuments of the Mississippi Valley: Comprising the Results of Extensive Original Surveys and Explorations", Washington, DC: Smithsonian Institution (1848). 3. Century Magazine, ed. W.N. May, "Ohio’s Great Serpent Mound", Ancient American, Vol. 13, No.83, pgs.2,3,14-17 (2009). 4. 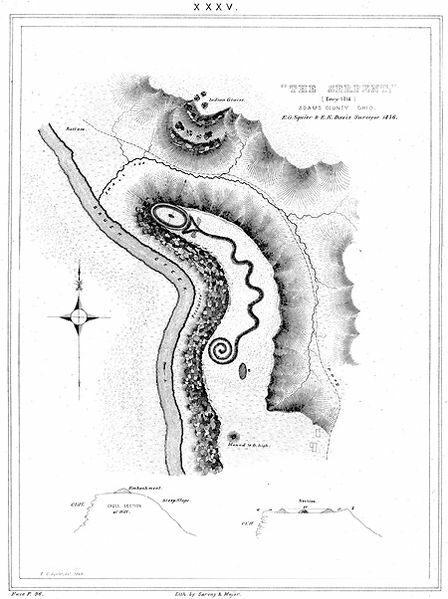 Putnam, F.W., "The Serpent Mound of Ohio", Century Magazine 39, 871-888 (1890). 6. Hamilton, R., "Re-dating Serpent Mound: What was the Serpent of Eden? ", Ancient American, Vol.14, No.87, pgs.36,37 (2010). 7. Siliotti, A., Egypt, Temples, People and Gods, Bergamo, Italy, 1997. 8. Kemp, B.J., Ancient Egypt, Anatomy of a Civilization, London, Routledge, 1991. 9. Wallis Budge, E.A., Osiris and the Egyptian Resurrection, 2 Vol., Dover Pub., N.Y., 1973 (ISBN 0-486-22780-4). 12. De Jonge, R.M., and Wakefield, J.S., "The Discovery of the Atlantic Islands", Ancient American, Vol.13, No.81, pgs.18-25 (2008). 14. De Jonge, R.M., "The Discovery of Three Continents (Santo Stefano, North Sardinia, Italy, c.2300 BC)", Ancient American, Vol.12, No.76, pgs.28-29 (2007), Ref.13. 15. De Jonge, R.M., "The Mystic Symbol, mark of the Michigan Mound Builders", Ref.13, to be published. 16. De Jonge, R.M., "Houghton’s Petroglyph (Copper Country, Michigan, 2500-1200 BC)", Ref.13, to be published. 17. De Jonge, R.M., "A Sword for America (Kirkburn, East Yorkshire, England, c.250 BC)", Ref.13, to be published. 18. De Jonge, R.M., "Cahokia, Capital of Ancient America", Ref.13, to be published. 20. Clube, S.V.M., and Napier, W.M., The Cosmic Winter, Blackwell, Oxford, 1990. 21. Joseph, F., Survivors of Atlantis, Their Impact on World Culture, Bear & Co., Vermont 2004 (ISBN 1-59143-0-040-2). 22. Baillie, M., Exodus to Arthur, Catastrophic Encounters with Comets, BT Batsford Ltd., London, 1999 (ISBN 0-7134-8681-3). 23. Grondine, E.P., Man and Impact in the Americas, Kempton, Illinois (2005) (ISBN 0-9776- 152-0-0). 25. De Jonge, R.M., "Discovery of America and the Flood (c.2300 BC, Ita Letra, Villarrica, Paraguay)", Ref.13, to be published. 26. De Jonge, R.M., "The Discovery of Australia and the Flood (The Rainbow Serpent Shelter, Mt. Borradaile, Arnhem Land)", Ref.13, to be published. 27. De Jonge, R.M., "The Ikom Monoliths and the Flood (1200 BC-200 AD, Cross River State, Nigeria)", Ref.13, to be published. 28. Rydholm, C.F., Michigan Copper, The Untold Story, Winter Cabin Books, Marquette, 2006 (ISBN 0-9744679-2-8). 29. De Jonge, R.M., The Phaistos Disc Decoded, New Testimony of a Lost Civilization, Midwestern Epigraphic Journal, Vol.20, 111-115 (2006), and Vol.21, 74-80 (2007), to be published. 30. De Jonge, R.M., "The Battersea Shield (River Thames, London, c.190 BC)", Ref.13, to be published. 31. De Jonge, R.M., "Copper Trade with the Old World (Poverty Point, NE Louisiana)", Ref. 13, to be published. 32. De Jonge, R.M., "Petroglyph of a Sailing Boat (Copper Harbor, Upper Michigan, c.1640 BC)", Ref.13, to be published. 33. De Jonge, R.M., "The Brandenburg Stone, Comet Catastrophe of 536/540 AD" (560 AD, Battletown, Meade County, Kentucky), Ref.13, to be published. 34. De Jonge, R.M., "About the Brandenburg Stone (560 AD, Battletown, Meade County, Kentucky)", Ref.13, to be published. 35. De Jonge, R.M., "The Myths of Monks Mound (Cahokia, Illinois, 650-1400 AD)", Ref. 13, to be published. 36. De Jonge, R.M., "Ikom and the Dardanus Flood (c.1159 BC, Cross River State, Nigeria)", Ref.13, to be published.